The styling itself was not even planned like this as I only searched for an appropriate outfit for the Miss Virtual World 2013 finale. 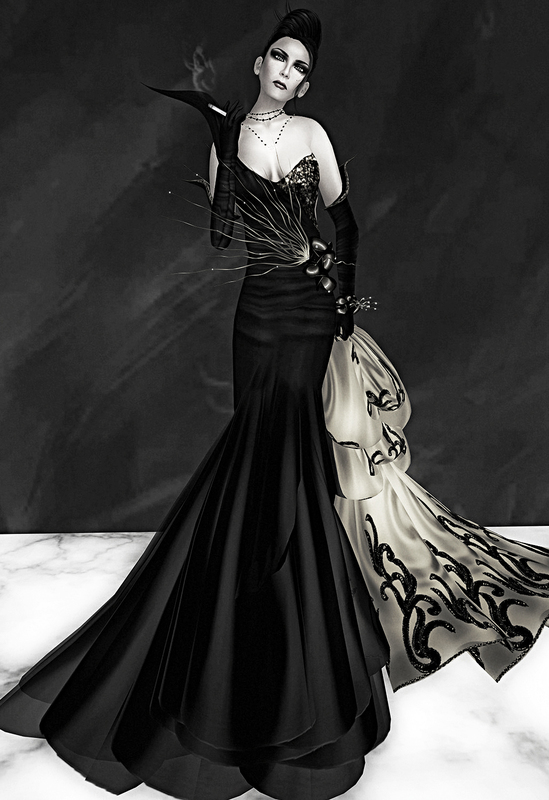 I combined parts of PurpleMoon’s “Falbala” dress with skirt of the “Paulinha” gown from Azul. The jewelry as well is a mix of 2 different sets of Finesmith, the “Falbala” bracelet and gown decor paired with the “Radiance” earrings and necklace. The coat, that I carry in my left hand is part of Tres Beau‘s “Diana” outfit. I was not wearing it at the finale of MVW 2013 but for the picture I wanted to, it was an amazing detail I did not wanna miss 😉 I just recolored the white to a golden tone to match the jewelry. In the end it was Malicia Python, who brought me on the idea of Rita Hayworth as we talked and I was thinking of a background and scenery for snapping the styling.